The speed and athleticism of the Italian Greyhound will often draw owners toward names of famous sports figures and Olympians. Jamaal, Bolt, and Tyson are a few names that fall in line with the theme of fast. On the fictional side of things, Flash, Sonic, and Speedy are all known for their quickness. Historical evidence of the breed has been found among the ruins of ancient Pompeii in Italy. Venice, Sicily, and Naples are few names taken from places in Italy. Popular Italian dog names include Bianca, Caterina, and Romeo. Some of the most fun dog names come from children. If you don't have access to a child's opinion, you can mimic the results by thinking like a child. For example, try thinking of names related to a favorite candy or snack food. Names like Skittles, Oreo, and Taffy come to mind. Some of our pages will contain a subcategory. A subcategory is a slightly more specific grouping than the main topic of the page. For a subcategory, we will include a separated table of names and corresponding descriptions. An example of a subcategory of Red Dog Names would be 'Dog Names Inspired by Red Wines'. 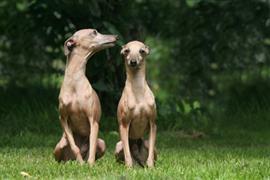 If you have any subcategory ideas for the Italian Greyhound Names page, we would love to hear them. Use the form below to submit your ideas.